Adopting a cat can bring so many benefits to both you and your feline friend. Not only are you giving a cat a second chance at a happy life in a home; your cat with pay you back with love and more than likely some crazy cat antics that will have you smiling every day! At OAS, we see many cats coming and going through our gates. By adopting one (or more) of our cats, you are freeing up a pen for another cat that needs our help to be rehomed. We take on cats regardless of their age, colour, temperament or health issues. We endeavour to find each and every cat in our care a loving new home; and we dedicate our time to making their lives as homely and enriched as possible until that new home comes along. Often rescue cats are seen to be the cats that all have behavioural problems. However, the cats that enter our care generally haven’t done anything wrong; it is usually the circumstances of the owner that lead to them being given up. The most common reasons are: the owner is moving to accommodation that doesn’t allow pets, allergies to the cat, a new baby in the household, or the owner is unable to afford vet bills. Cats are naturally independent creatures that don’t require as much supervision as a dog. This means that cats are very adaptable to living in a variety of home environments. Like people, cats have very individual characters. Some are more independent and just want to have a home to call their own and company when they want it. Whereas others love a good cuddle and want to be there with you all the time requesting a fuss. Cats are also very clean animals so require little maintenance in that respect. Lots of cats do like a nice brush though, this is a good way to bond with your cat whilst keeping their coat in tip top condition. In addition to keeping themselves clean, cats come into your life toilet trained. You can set up a litter tray and they will use it naturally. Adopting a cat means not having to worry staying up late and getting up early to let them out for the toilet in the cold and wet! Cats love to sleep – up to 18 hours a day in fact! They are also happy to entertain themselves with toys, and often inanimate objects like cardboard boxes and pens. If you’re not a very active person, a cat could be the pet for you; you would be gaining a feline friend to spend quality time relaxing with. At OAS we have cats that boast so many different characteristics. The cattery team work tirelessly with the cats every day to get to know them and allow their characters to shine through so that we can match them with the purrfect home. Although that cute little picture of a kitten or cat on a for sale site is adorable, do you know the history of that cat? Has it seen the vet recently, or has it been treated for fleas and worms? Are you going to buy that cat and face immediate vet bill costs? There are a lot of unofficial breeders in the UK that breed and sell kittens for profit. Lots of these cats are overbred and when their kittens are subsequently not neutered there lies a vicious cycle of more and more cats being born into the world. Unfortunately, a lot of these cats and kittens end up in rescue centres because they are unwanted. Adoption helps stop pet overpopulation. There are too many animals and not enough homes. Shelters and sanctuaries have been facing a pet overpopulation problem for the last few decades. 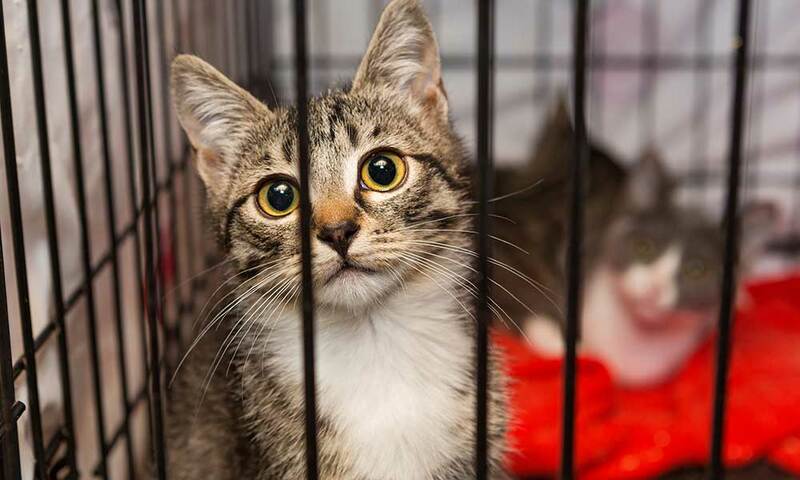 We neuter and vaccinate all of the cats in our care to protect them from prevalent diseases in the environment that can cause them or others harm. This ensures the animals we adopt into the community do not contribute to pet overpopulation or disease spread. Each cat is also microchipped and registered on the UK pet database so in the event that they ever got lost they can be reunited. Our adoption fee is just £75 for a cat. Every single cat receives the best veterinary care during their time with us; and each cat receives a full health check before they got to their loving new home.